In recent years there has been a quiet revolution in hedge trimming. Not in the way it is done, but in what tools are used to do it. Commercial landscapers and other gardening professionals were the first to embrace this change, but gardeners are now starting to get on board too, and they are discovering that it is possible to both throw away that noisy, smelly, gasoline-driven trimmer, and forget about that awkward and dangerous trailing cable too. The battery revolution that gave us the cordless phone, then the cordless vacuum cleaner, and dozens of other cordless appliances, has now given us the cordless hedge trimmer – bringing a freedom to trimming that has to be experienced to be believed. Cordless trimmers have two major advantages over the older choices. First, they are as quiet as any electric trimmer – it is really just the cutting action itself that makes noise, since the electric motor is basically silent – but that trailing cord, and yards and yards of extension are gone. Until you try one it is hard to realize the freedom you have, but trimming suddenly became a whole lot more pleasant. Plus, the elimination of the gasoline engine means not just quiet, but a total lack of fumes, and no gas-cans in the garage either. We are all much more aware of air pollution than we used to be and removing that smelly – and often smoky – machine from your yard is wonderful. Now you can smell the fresh-cut cedar instead of gas fumes. How Much Trimming Do I Need to Do? This is the first question to ask yourself. If you have one large hedge, then how long do you currently take to trim it? If you have planted a new hedge – maybe with Thuja Green Giant – then you might not have much idea, and it depends very much on how tall your hedges are. Also, there is a limit to how long you can work trimming without a break. However a hedge trimmer that runs out of power in less than an hour is only going to be useful for small shrubs around the house, or a short section of boxwood. Tests of cordless trimmers show that between one and two hours is normal, despite what manufacturers may claim. If you choose a smaller machine, then consider getting a second battery, which will avoid the problem of suddenly running out of power just when you are almost done. Even if you don’t think you will need a second battery, check if you can buy one, as some trimmers don’t offer that, and if the battery fails you will be looking at buying a whole new trimmer. How Long Do I Need to Spend Trimming? As a home gardener you probably won’t need more than a couple of hours, and remember too that there is only so long you can hold a 10-pound machine in the air. Most better-quality cordless trimmers will last between one and two hours before needing charging, which will probably be sufficient for a session – keep it turned off when you are moving around, putting up or taking down ladders, etc., and only run it while you are actually trimming. If you want more time, or those commercial landscapers reading, there are two options that will help you keep going longer. Move to a backpack battery – which is also a good option if you find the weight of a trimmer with its battery a bit much – as these have much longer run-times, or secondly, invest in a STIHL trimmer. This company pioneered battery-powered garden equipment, and their tools have outstanding battery life – the AP300 36-volt battery is good for about 5 hours of steady running. How Often Do I Trim? This might seem like an odd question, but it relates to a major limitation with trimmers, which is the thickness of branches they will cut through. 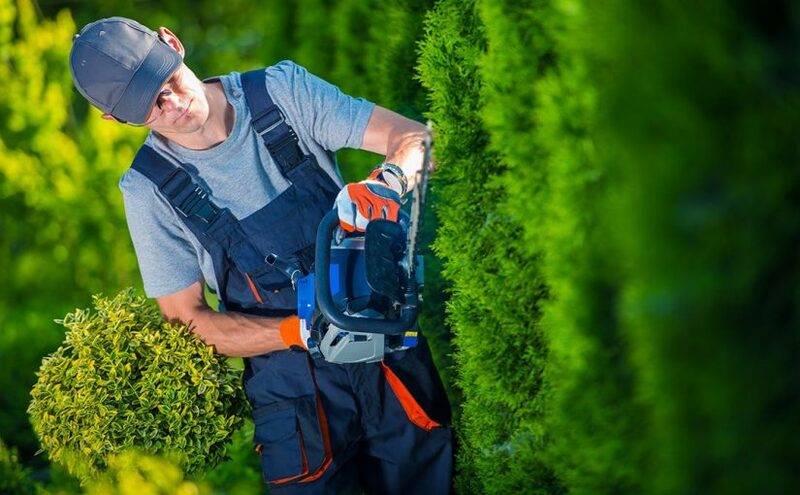 If you don’t trim often, or just have an informal screen you cut back every couple of years, then you will need a trimmer that can cut through ¾-inch material. There are two things to look at here. Look at the absolute width of the guide spaces – obviously you can only cut what will fit into the guide – and secondly, how quickly will it cut through that branch. There is a surprising degree of variation in this test, but generally a more powerful machine will obviously cut faster. If you trim infrequently, then you should consider a more powerful machine, and avoid the frustration of jamming branches, or resorting to loppers to get the job done. If you are a frequent trimmer, then you will be cutting thinner and softer material, so this issue is going to be less important to you. How Tall and Wide is My Hedge? When putting in a hedge, and deciding on its height, always go for the minimum. It becomes exponentially more difficult to cut hedges as they increase in height and being able to trim from the ground is so much faster than using ladders. The length of the cutting bar, and the availability of extension pieces, are big factors to consider if you have taller hedges. Some extensions can cut at 90o, which means you can trim the top from the ground. Cutting bars vary in length, and between 16 and 20 inches is a good all-round length to go for. Shorter blades are perfect for smaller bushes, and longer ones – they go up to 40 inches – are a good choice if you have a large hedge. Obviously this is important to us all. Expect to pay about $100 for a basic, lower-power trimmer, and over $200 for something more durable and substantial. Commercial-grade equipment will run much higher, but using it is over-kill for most home gardeners.